I decided to sign up for Yummly notices a few years ago. Honestly, it's often overwhelming getting their emails several times a week, each filled with links to recipes they are highlighting for various reasons. BUT, I keep seeing new, mouth watering ideas. Just wish I had more time to try them out. The credits on this recipe requires a little more explaining. The image and the recipe as it stands are from a blog call Life Made Sweeter. In checking out the site, I saw a ton of great recipes, so I would give it a look. However, the author notes that the basis for this recipe was adapted and reprinted with permission from a new cookbook by Trish from Mom On Timeout called 100 Creative Ways to Use Rotisserie Chicken in Everyday Meals, so I wanted to fully credit both. The fillings really pile high on the naan bread, making each of the four pizzas super filling. My big eating men only had one each with a side of cut fresh veggies and a few bing cherries and were full. That in itself is incredible. While I loved this recipe and would make it again, I found it didn't have as strong of a Thai peanut flavour as I expected. I'm going to try using the creamy peanut butter option next time to see if that ups the flavour. I also used a shy 1/2 teaspoon of crushed red pepper flakes as my husband doesn't like things spicy, but I could have easily used more as it didn't add more than a touch of heat. Super easy to make, lots of fresh ingredients, only 10 minutes in the oven and super filling. Just what I needed to end a sunny, hot June day. Kudos to both Life Made Sweeter and Mom on Timeout on their creativity. And I'm going to have to check out that cookbook! Combine peanut butter, teriyaki sauce, and red pepper chili flakes in a medium microwave-safe bowl. Heat on high for 20-30 seconds and stir until completely combined. Spread half of the peanut butter mixture onto the flatbreads. Then, set aside. Add the chicken to the bowl with the remaining peanut butter mixture and stir evenly to coat. Top the flatbreads with about 5 ounces of the cheese. Divide the chicken, carrot, bell pepper, green onions, pineapple, and spinach evenly among the pizzas. 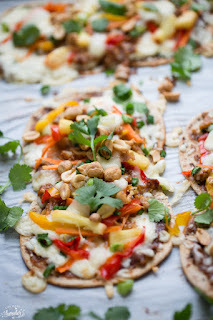 Top with the remaining cheese and sprinkle with chopped peanuts, if using. Bake for 10 to 12 minutes, or until the cheese is melted and bubbly. Garnish with additional peanuts and fresh cilantro, if you'd like.